Friday nights call for simplicity when it comes to pulling together dinner. I’m active in long-distance cycling and needed to carb up for a big, hilly, challenging ride tomorrow morning. Pasta was the only answer. Specifically, the bucatini shape of pasta. Bucatini is long and round, like spaghetti, but much thicker in width. It’s density provides a satisfying chew. I could just eat bucatini with butter. Then again, I did need veggies and protein to prepare for the big bike ride. For the rest of the ingredients, I also wanted to use leftovers from last night: grilled chicken and sautéed cauliflower. A tried and true combination that works great with pasta is cannellini beans and artichokes. The water in the canned artichokes serves as a broth to unify the rest of the ingredients. 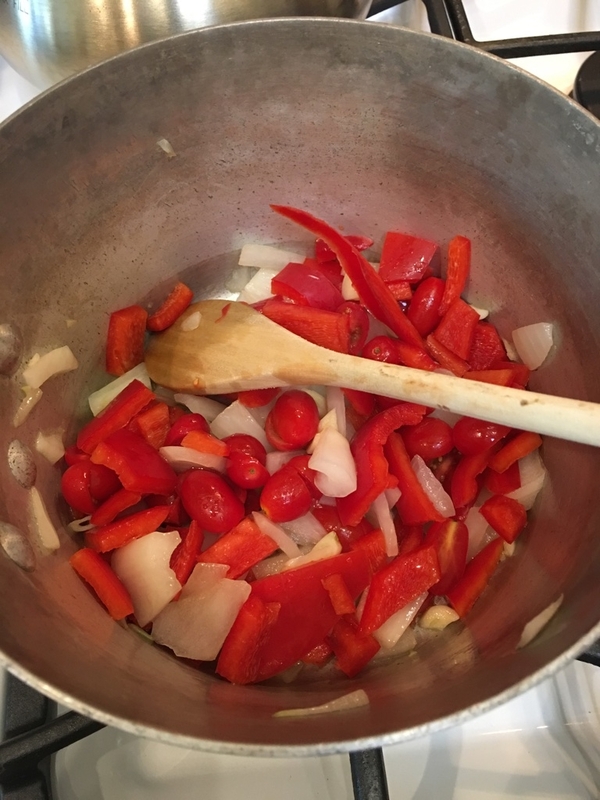 Here’s how I started with the cooking: I set out on the counter four cloves of garlic, 1/2 cup chopped sweet onion, 1 diced red bell pepper, 1/2 cup diced grape tomatoes, 1 can drained and rinsed cannellini beans, 2 cans quartered artichokes (do not drain), and 1/4 cup shredded parmesan. While the pasta water was heating to a boil in a large pot, I started sautéing the garlic and onion in a large saucepan with olive oil. Once the onion softened and turned gold, I added chopped red pepper and the tomatoes. At this point, I seasoned the contents of the saucepan with salt and pepper. Next, the rinsed beans rolled into the pan and the contents of the two artichoke canned went in. Those flavors combine fairly quickly at medium-high heat, stirring occasionally. 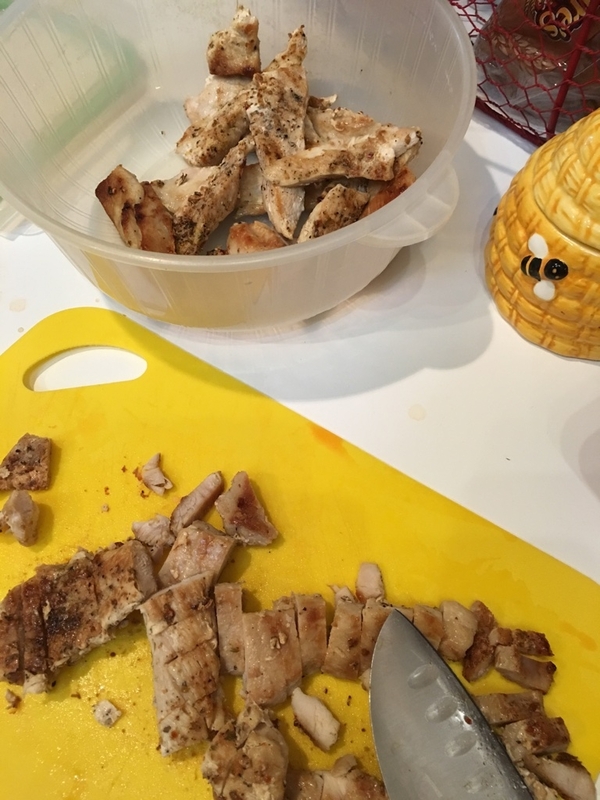 The grilled chicken was cut into bite-sized pieces and was heated in the microwave. Same with the leftover cauliflower. 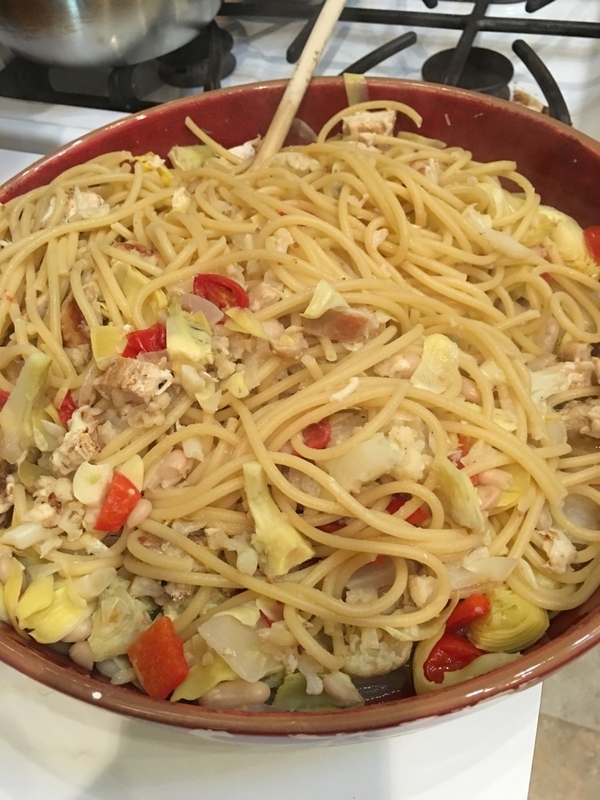 The chicken and cauliflower was then placed in a large pasta serving bowl. Those ingredients were sprinkled with the cheese. Once the pasta was cooked and drained, I tossed it in the serving bowl to mix with the cheese, chicken and cauliflower, along with a dollop of SmartBalance butter alternative. Finally, the contents of the saucepan were poured over the top of the pasta bowl. The artichoke-infused water softly binds all the ingredients together, in terms of consistency and flavor. I feel satisfied that this meal will provide me with the right energy to take the hills on my bicycle. Maybe it’s psychological, but if and when I feel fatigued while climbing the hills, I can tell myself I have it in me because I ate the right dinner with carbs and protein. Of course, it will also help to hydrate more before bed, upon waking and while driving my bicycle out to the country town where the cycling group is meeting and riding. The really key thing for me first thing in the morning will be coffee, strong coffee. For the riding, I will have special sports mix for my water and protein bars. Afterward, the cyclists will hang out on the town square for a cookout with burgers. I’m hoping to ride around 60 miles tomorrow and the socializing will be the best part of the day. Well, the views are going to be amazing as well. All of the above are the motivation to keep pedaling those hills: bucolic views, friendship and burgers. I don’t normally eat them, but one doesn’t feel guilty about it after many miles of biking. I’m a little nervous about those hills, but still looking forward to it.